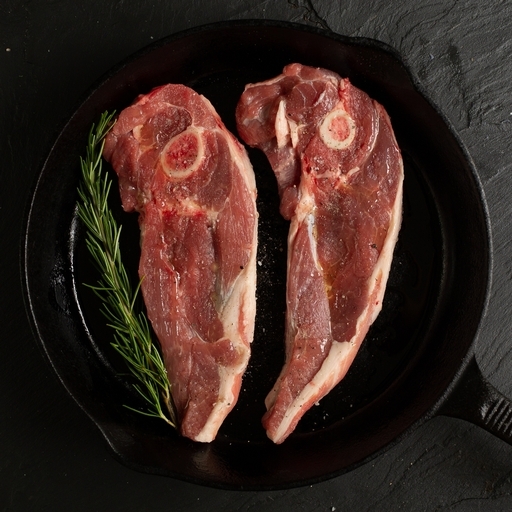 Fresh organic lamb shoulder chops from the Riverford butchery. Really versatile, these lamb chops are tender enough to fry or grill and also excellent braised or stewed. We leave the bone in, which bastes the meat naturally as it cooks, giving a richly flavoured and succulent meat. You can cook these chops fast, like a steak; the meat isn’t as tender, but the flavour is deeper. Season generously and brown well in a hot, oiled pan for about 3 mins per side for medium. Leave to rest for 5 mins before serving. They are best suited to slow braising into a stew, casserole or curry. Season well and brown in a pan before adding to the dish of choice. Cook very gently for 2-3 hours until completely tender.